A planet is generally said to be void of course when it is not applying to an aspect with any other planets, although the specific requirements of the condition vary based on which definition is used. Originally the concept was only applied to the Moon, and typically when it is used today this is still the primary application, although in some traditions other planets can be void of course as well. There are at least two different definitions of void of course that are used by astrologers from different traditions, and potentially as many as three. All three definitions will be given separately below. The concept of “void of course” first appears in the Hellenistic tradition, around the 1st century CE. The original Greek term for void of course was kenodromia (κενοδρομία), which means “running in the void” or “running in the emptiness”. The condition of being void of course was only applied to the Moon, and it was originally defined as occurring when the Moon was not applying to an exact Ptolemaic aspect with any other planets within the next 30 degrees, regardless of sign boundaries. This definition is given in chapter 23 of Porphyry of Tyre’s Introduction to the Tetrabiblos. In this way the Moon is figuratively running through a void or an empty spot in the zodiac, because she does not form any aspectual relationships with other planets during an entire two day period. For example, if the Moon is at 15 degrees of Cancer, it would be considered void of course if it did not complete an exact aspect with any other planet until after it passed 15 degrees of Leo, which is a full 30 degrees later. 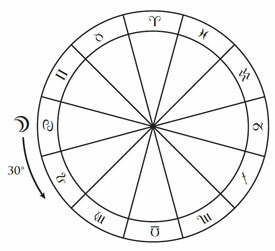 If there were any planets in late Cancer or early Leo, or if any planets were casting their rays to the same areas in those two signs, then the Moon would not be void of course, according to the Hellenistic version of the definition. 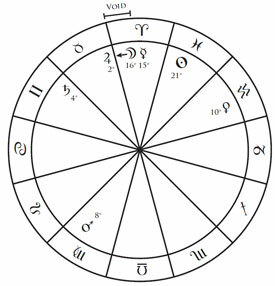 In the Medieval tradition the definition appears to have changed, so that void of course was said to occur when the Moon did not complete or perfect an exact aspect with any other planets until it moved into the following zodiacal sign. Within this context, the range in which the Moon is void of course starts as soon as it completes its last aspect with another planet in the sign that it is currently in, and it ends as soon as it moves into the next sign. In the example to the right the Moon at 16 Aries became void of course as soon as it completed its last exact aspect in the sign that it is in, which was a conjunction with Mercury at 15 Aries. The Moon is considered to be void of course until it moves into Taurus, because it will not complete any exact aspects with other planets until it moves into the next sign. 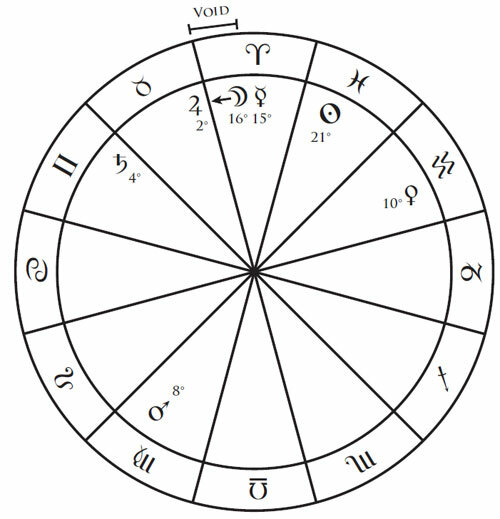 Note that if any planets were either located at or cast their rays to the area from 16 to 29 Aries, then the Moon would not be void of course in this chart. In the Medieval tradition the definition was also changed so that any planet could be void of course, although the Moon was still the main body that the condition was usually applied to. 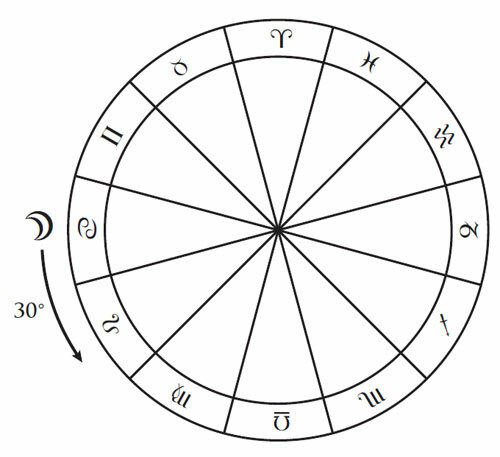 It is not clear why the definition of void of course changed so drastically between the Hellenistic and Medieval traditions, although it may have had to do with the development of horary astrology, which places more emphasis on the perfection of aspects before planets change signs than natal astrology does. The Medieval version of the definition of void of course was used by the early English astrologers of the 17th century, and from there it was transmitted to the modern tradition, thus becoming the prevailing definition of void of course in modern astrology. Beginning in the late 1980s and early 1990s some astrologers noticed that the famous 17th century astrologer William Lilly did not seem to use the typical modern definition of void of course consistently in his chart examples, and some inferred from this that he was using a completely different definition of void of course. In her 1995 article titled The Considerations Before Judgement astrologer Sue Ward argued that Lilly’s definition of void of course had been misunderstood. Lilly is usually used as a primary source for the modern definition of void of course, where a planet is void when it will complete no other aspects until it moves into the next sign. However, Ward argued that Lilly’s actual working definition in chart examples was that a planet is only void when it is not applying to an aspect with another planet within orb, regardless of sign boundaries. This interpretation of Lilly’s definition of void of course is similar to the original Hellenistic definition in that it ignores sign boundaries, although it happens much more frequently than the Hellenistic definition because Lilly’s orb for applying aspects tends to be less than 10 degrees. Unfortunately since this interpretation of Lilly’s definition of void of course is largely based on inferences made from his chart examples, it is still somewhat controversial. Some astrologers agree that this is a correct interpretation of what Lilly meant, and thus that there is a third definition of void of course, while others do not agree that this is a correct interpretation of the text, and thus they believe that there are only two potential definitions. The Moon does not complete an exact Ptolemaic aspect with any planet within the next 30 degrees. The Moon does not complete an exact Ptolemaic aspect with another planet until it moves into the following sign of the zodiac. The Moon is not applying to an exact Ptolematic aspect within orb. Dykes, Benjamin N. (trans. and ed. ), Introductions to Traditional Astrology: Abu Ma’shar and al Qabisi, Cazimi Press, Minneapolis, MN, 2010. Lilly, William, Christian Astrology, 1647 (repr. Ascella, London, 1999). Porphyry the Philosopher, Introduction to the Tetrabiblos, trans. James Herschel Holden, American Federation of Astrologers, Tempe, AZ, 2009.